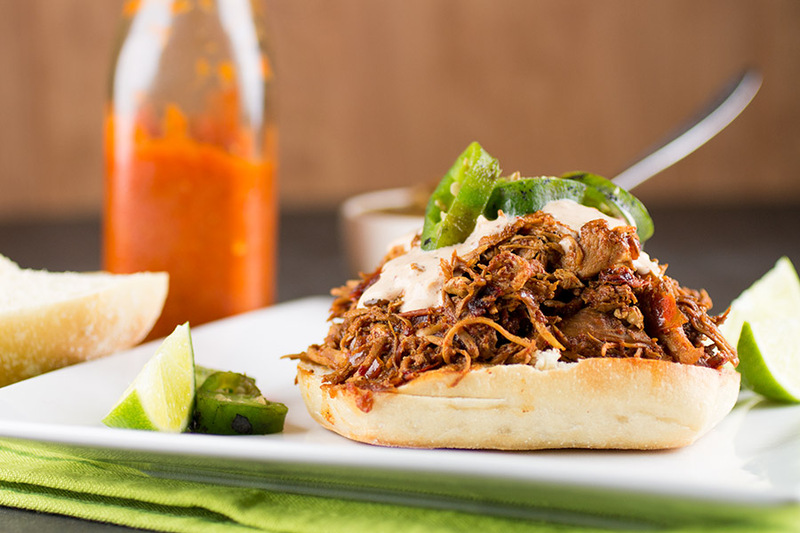 A Mexican sandwich recipe made with shredded chicken, served on torta bread rolls and topped with a creamy, tangy ancho-lime sauce. There are SO many days we bop on down to the local Mexican restaurant for a quick lunch on our crazy-busy work days. Usually the hardest decision is what to order. Tacos? Burritos? Tostadas? Should we get a side of guacamole? (UM, YEAH!). How about a Torta? YES! 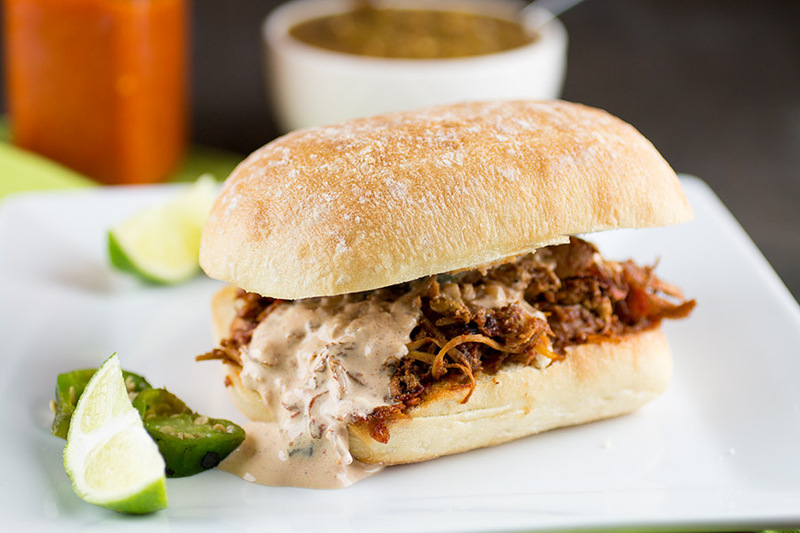 Today, we’re staying IN for lunch and making our very own torta sandwiches. Have you ever had a torta? A torta is a Mexican sandwich made with different types of highly seasoned, chopped or shredded meats, along with various toppings, like refried beans, lettuce, cheese, sour cream or crema, and of course, plenty of hot sauce. No matter how many different Mexican restaurants you visit, you’ll find a unique variation at each place. And they’re ALL freaking good to me. This is a version unique to the Chili Pepper Madness household. They aren’t hard to make at all. Quite easy, in fact. The longest part of the recipe is cooking down the chicken so you can shred it. You can do it quickly, but I suggest taking your time a bit with the recipe. Let the chicken absorb all those wonderful flavors you’re working with. The resulting torta sandwich will be that much better for it. Instead of adding a simple crema or sour cream, I like to bring in a bit more flavor, with an ancho-lime cream sauce made with Mexican crema, though you can use sour cream instead of crema. Oh baby! I LOVE the tanginess of the sauce. Top everything off with roasted jalapeno peppers and your most very favorite hot sauce in the world, and you’re good to go. Of course, feel free to add other toppings, like diced avocado, shredded lettuce, cheese, but hey, this is how we like it. Heat a pan to medium heat and hit it with some olive oil. Seasoning the chicken breasts with garlic powder, taco seasoning and salt. Sear each side a couple minutes, then reduce heat. Add chicken broth or beer and let it sizzle up. Cover and cook it nice and slow about 30 minutes or so. If it dries out, just add a bit more broth or beer. While the chicken is cooking, add the ancho peppers to a small pot with about a cup of water and bring to a boil. Remove from heat and let it steep about 20 minutes or so. Seed and stem the anchos and add to a food processor with the garlic, onion, and a couple tablespoons of the ancho water. Process to a thin paste. Add the paste to the pan with the chicken, but reserve a couple tablespoons. Add the reserved ancho paste with crema and lime juice. Mix well and refrigerate until ready to use. When the chicken is ready, shred it with a fork and set onto toasted buns. 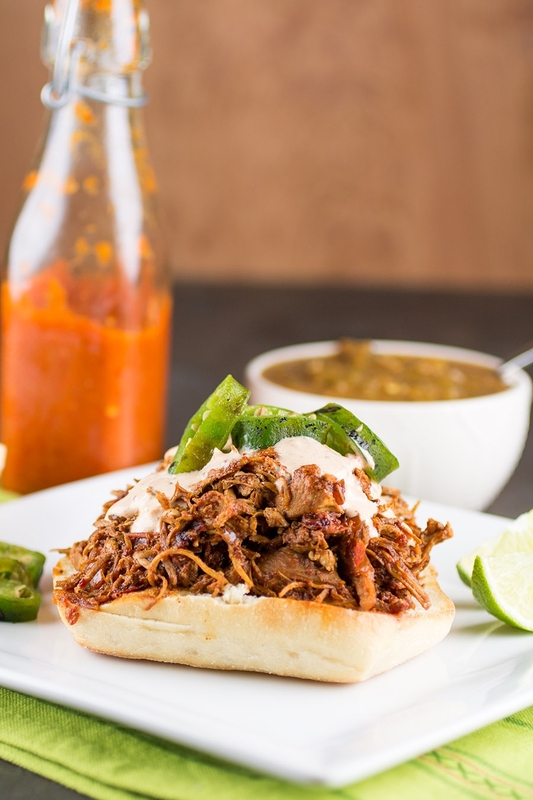 Top with your ancho-lime cream sauce (crema), sliced jalapeno peppers and your favorite hot sauce. Question… After you add the paste back to the pot with the chicken do you let it cook for awhile? Or is it just to coat the chicken with the ancho paste? I have gotten some unbelievable recipes off your outstanding newsletter, but this one sets the bar, and I haven’t even made it yet. Chicken or pork or beef, just a tad bit of tweaking and the result is making my mouth water at the very thought of it.